The Squish IDE, built on Eclipse, provides a feature-rich integrated development environment for GUI testing. Complete with test management, script debugging and an interactive application object spy. 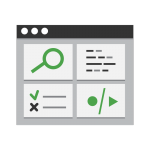 Move easily from one task to another, using Squish’s customizable activity-based Perspectives, automatically placing the correct tools at your finger tips as you create and manage your test suite.